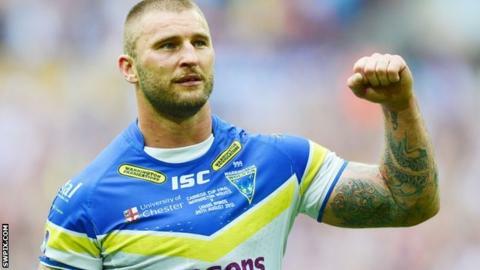 Warrington Wolves prop Paul Wood has had a testicle removed after rupturing it in Saturday's Grand Final defeat by Leeds Rhinos. The 30-year-old was injured early in the second half but played on before going to hospital after the match. He told BBC Radio Manchester: "I'm not too bad, it sounds worse than it is. "An accidental knee caught me. I could feel I wasn't right, but I managed to stay on for 20 minutes until [the coach] Tony [Smith] took me off." Despite his heroics the Wolves were unable to claim their first title since 1955, as they and Wood insists he did what any other professional player would do. "It does smart a bit when you get hit down there, but this pain wouldn't subside," he continued. "As a rugby player you just do your job until you hear the whistle, there was nothing special about it." Although he did concede he may consider using added protection next season. "It's something I'm going to look at because obviously I've only got one now - so I've got to look after it. "If I want any more kids this has got to be my pride and joy." Wigan-born Wood turned to Twitter following his operation when he posted: "Ruptured my right testicle, got a knee 1 minute into the second half, had to have it removed." "Just coming out the hospital to go home... Seriously feel like I've left something?" The prop forward also disclosed that his team-mates had been ridiculing him in his adversity. "They're relentless really, they absolutely give it to me. I've had every text message under the sun to wind me up - but I can take what's happened." Wood is not the first sportsman to sustain a painful injury in the line of duty. Last season, Blackburn Rovers defender Scott Dann suffered a similar injury and was ruled out for six weeks. Also in 2011-12, Gillingham's Chris Whelpdale split his scrotum in a Boxing Day win over Crawley. The winger was able to take to the field just four days later in a defeat at Dagenham & Redbridge. In 1986, New Zealand number eight Wayne Shelford sustained a torn scrotum during a ruck in a match against France.